In a recent Environmental Research Letter article, Yang Chen, et al, demonstrated how by use of sea surface temperatures, predictions of oncoming seasonal drought could be used to determine fire season severity. 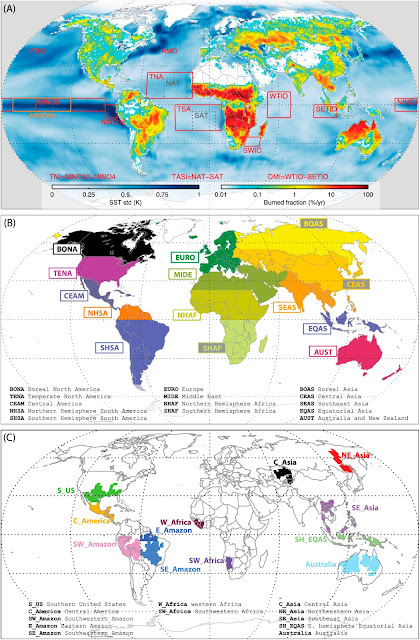 The research shows correlations between sea surface temperatures in 14 ocean indices areas could predict fire in 12 "hotspot" regions, using the GFED data for the fire and emissions correlation. In a current example of their process, through 2015, drought in the Amazon basin deepened as El Nino strengthened in the Pacific, and the Atlantic remained anomalously warm. The SST anomaly affecting the Amazon has continued through July 2016, despite El Nino's official end. This SST anomaly impact is apparent rainfall anomaly results from TRMM for South America from for 180 days prior to January 23, 2016. the first shows the actual rainfall anomaly in millimeters, the second as percentage of normal. This effect continued into 2016 as drought continued to grip the Amazon and northern South America as shown in the TRMM 180 day rainfall anomaly imagery from July 7, 2016. The first image below depicts the anomaly in millimeters, the second as percent of normal. 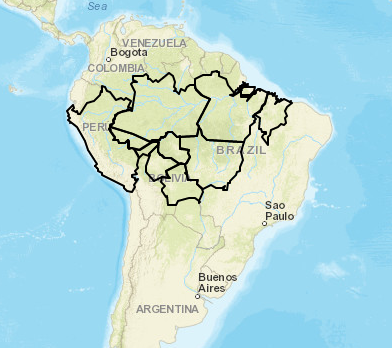 The result is that the Amazon basin has minimal ground moisture and rain forest stressed by severe drought. GRACE imagery compares the last few drought years for groundwater and soil moisture as terrestrial water storage to the current drought - with 2016 being the most dire conditions to begin the Amazon fire season since 2002. 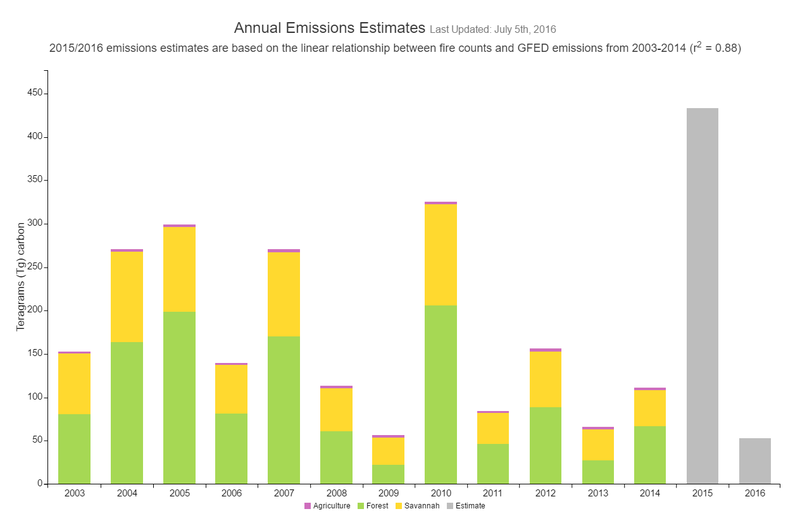 The fire counts for these prior years are available in the GFED monthly data for 2001-2015, likely to be exceeded by 2016's upcoming fire season. In 2015, the predictions of fire severity for these regions were low to moderate, depending on the region. While the initial 2015 fire severity prediction was low to moderate, El Nino drove fires and emissions to high levels. 2015 saw 240,492 fires counted by MODIS as depicted by the light blue line below, the highest fire count since 2003. 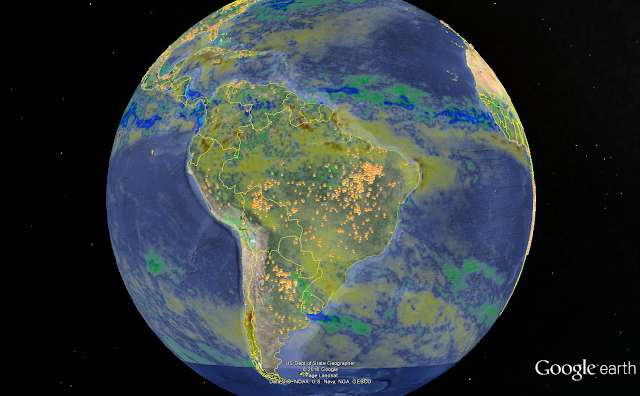 It resulted in the highest CO2/GHG fire derived emissions from the Amazon since 2003. Given the drought of the last year, driven by El Nino and Atlantic sea surface warming, the 2016 Amazon fire season begins with severe dryness. As noted in the UC Irvine fire risk website, "Sea surface temperatures (SSTs) in the tropical Pacific Ocean during October-April were at record high levels relative to the 2001-2015 period of satellite fire observations because of the strong 2015-2016 El Niño. Concurrently, SSTs in the tropical Atlantic during January-April of 2016 were above average. Combined, the elevated SSTs in both oceans provide evidence for extremely high fire risk for the Amazon during the 2016 dry season. Pará, Mato Grosso and Amazonas have the highest risk according to our forecast." As noted by the red line in the cumulative monthly fire count above, 2016 has 36,994 fires through July 5, 2016. This is exceeded only by 2004, with 41,518 fires, and is 52% more than 2015's 24,321. Given that we know that high temperature anomalies cause Amazon forests to dry, it's trees to slow CO2 intake, and increased fire levels - fire emissions are likely to be very high through 2016. The following depicts the last 30 day rainfall anomaly and fires burning in South America in the last 48 hours as detected by MODIS. 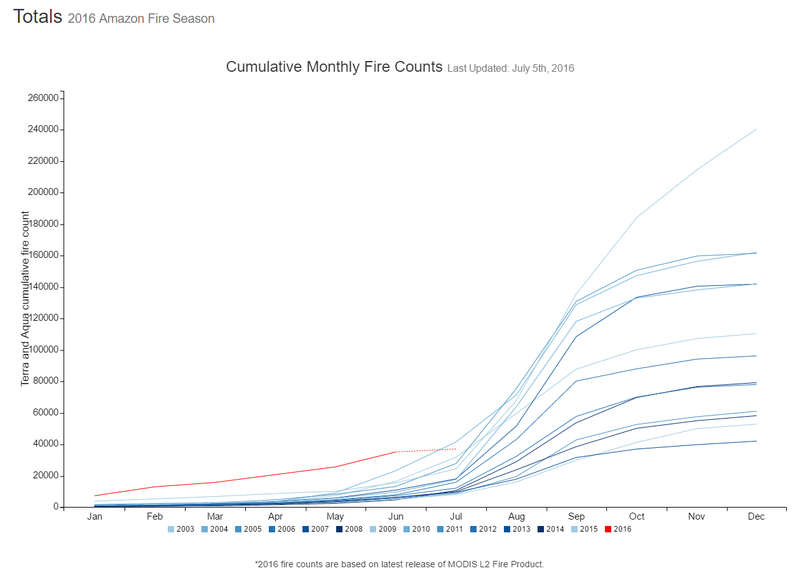 It is a glimpse of the extreme Amazon fire season to come. The consequence of this climate interaction of warming seas and drought results in a continued weakening of the Amazon as a CO2 sink, and its slow creep to becoming a CO2 source. As Philip Duffy, et al, warned in a 2015 PNAS paper, "The models also predicted that the area of the Amazon affected by mild and severe drought will double in the eastern part of Amazonia and triple in the west by 2100. Meanwhile, a wetter wet season and more rainfall could lead to more floods, as well." Source: Duffy, P. B., Brando, P., Asner, G. P., Field, C. B. (2015). 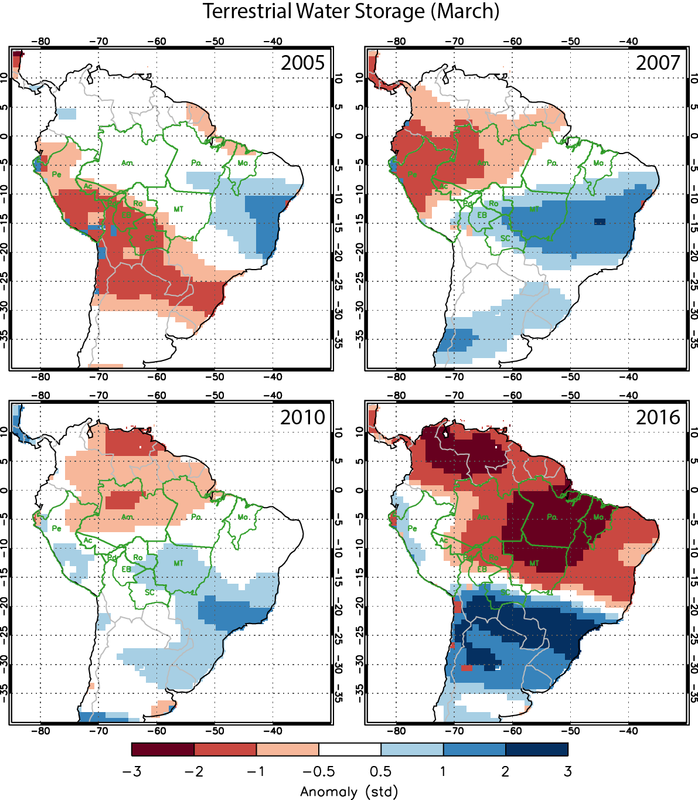 Projections of future meteorological drought and wet periods in the Amazon. PNAS, 10.1073/pnas.1421010112. Given the droughts of 2005, 2010, and now 2016, we may see an acceleration of the consequences above as more abrupt unanticipated change to come. That's disconcerting! I hate to think about what would happen if the Amazon rainforest became a carbon source instead of a carbon sink. Losing all that biodiversity would also be devastating. This is a concern. The other no one is discussing is the Congo. More on that in a future post.